His name is citizen Celestine Iwendi. He hails from Ogwashi-uku in Aniocha South Local Government Area of Delta State. 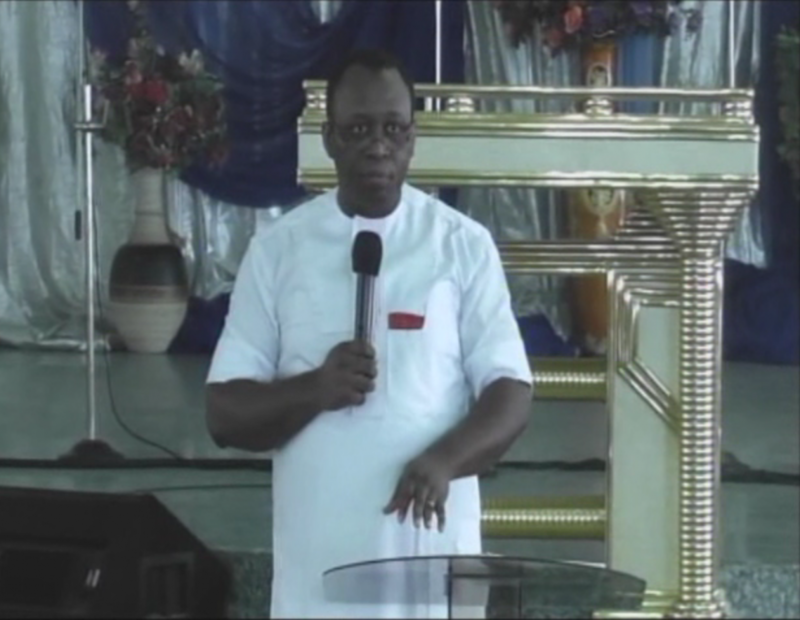 Dr. Iwendi is the President of Anioma for Christ Crusade Foundation. In this interview with DRUMBEAT NEWS, Dr. Iwendi bares his mind on some challenges confronting Ogwashi-uku and Anioma in general, including the crusade that is been organized by Christ Crusade Foundation. I am Dr Celestine Iwendi, the President of Anioma for Christ Crusade Foundation and with Mr Austin Nwanokwai, a trustee of Anioma for Christ Crusade Foundation and Chairman of the Foundation protocol committee. Also with me is Hon. Polycrap Elumeze, Chairman Accommodation and Logistics committee. Anioma people for development, youth and adult empowerment, spiritual unification and prayers. This is a vision borne out of love and concern for the advancement of our people and the need to seek this advance from the spiritual angle. We wish to bring Christ to our people and break any set backs that might be due to some ancestral courses or covenants and spiritual cleansing of our land. Awesome! The term Anioma means ‘Good Land full of potentials. Anioma for Christ is not a political organization, but a voice to showcase the goodies of our land and harness them for the betterment of the town and state. We have then put up a programme to actualize these goals. It is a season of supernatural manifestations, breaking of curses, unification and outreach. 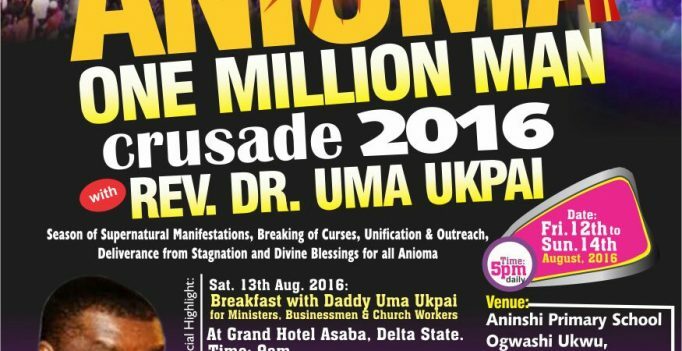 This is the long awaited encounter for Unity, breaking of Curses, Stagnation and divine blessings for Anioma. Anioma for Christ is a conscious and concerted effort to bring Anioma to her pride of place. But we believe that the first step will be to formally and openly declare the Lordship of Christ over the whole Anioma.When Would The Crusade Start? 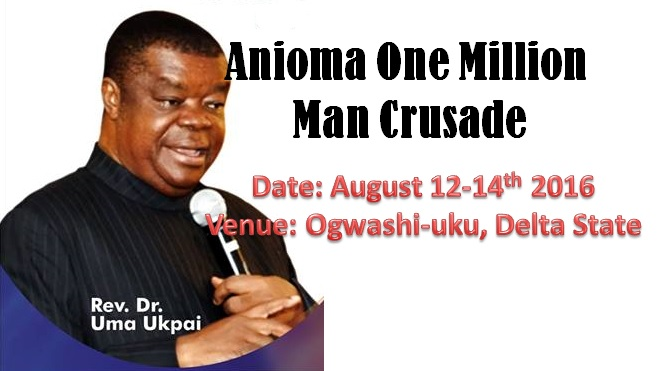 The crusade will hold from Friday the 12th of August to Sunday 14th of August 2016, at Ogwashi-uku Stadium Delta State, Nigeria. And we are bringing in Rev. Dr Uma Ukpai as the guest speaker. What Are The Aim(s) The Crusade? We want to use this medium to bring our people closer to God almighty by causing a mighty wave of the Holy Spirit to move upon the entire Anioma land. In partnership with PFN, Delta North Zone, CAN, sons and daughters of Anioma. A lot of people and groups within the town have shown so much enthusiasm towards this development. Do You Plan To Organize This In Future? It has come to stay. We set up the foundation because we want it to be a yearly event. We also have a website www.aniomacrusade.com. Remember that Anioma region is rich in natural resources including crude oil. Solid minerals in form of lignite, kaolin, silicon, gypsum etc are also deposited in Anioma. 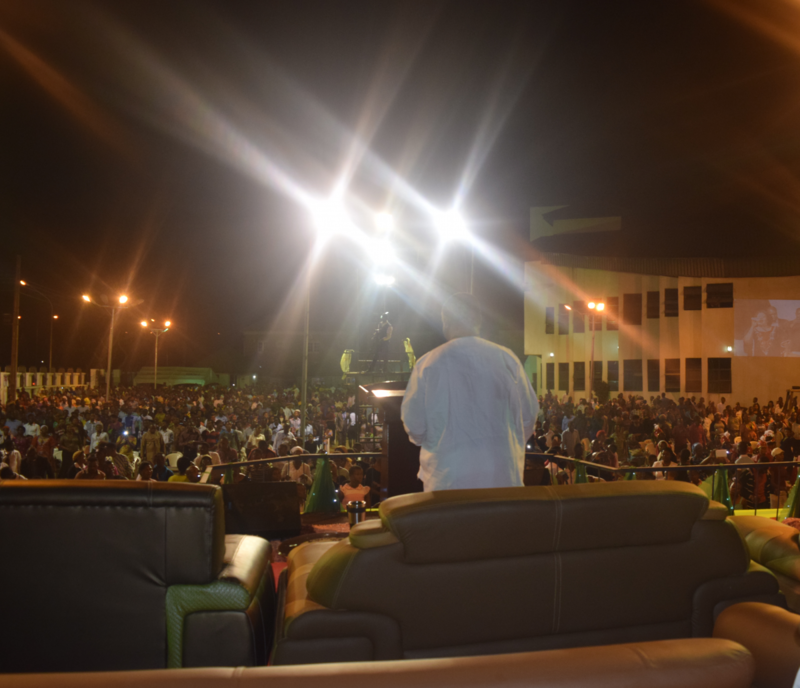 The region has been neglected by the government as per serious development. Also, in terms of Agriculture, the Anioma region is considered richer than many states. We believe that such programs will beam the searchlight on the area. For example, the town has been for many years without electricity. How Do You Plan To Bring People To Attend This Crusade? There will be bus service from Asaba to Agbor and also for people who want to camp for the three days will have the opportunity to do so. Like I pointed out earlier, we want to first of all initiate the nation into Christ. This is our foundation. It is not by accident we are Anioma. What Are Other Programmes Lined Up.? This foundation has other programmes apart from this crusade. We have primary and secondary school water and computer projects. In December, we carried out free Medicare for our people. Free glasses, tests, drugs all manner of ailments were handled and referrals sponsored. This Easter 25-28 March there will be free eye surgery for some indigent people that were diagnosed in December. We are also involved in other programmes that impart positively on our youths. Last year we sponsored some of our youths to a business roundtable in Lagos where they had such resource personnel as Tony Irabor, and chairman of the Zenith bank Jim Ovia. We are also planning an empowerment programme in conjunction with Ogwashi-Uku Polytechnic. We cannot succeed alone if our people are not united, and if love is missing in action. There Are Insinuations By Some Persons That Ogwashi-Uku Is a Cursed Land, Owing To The Fact That The Town Is Faced With Total Blackout And No Drinking Water. Will This Crusade Address Some Of These Challenges? We are bringing a man that has a mission to break the curses under which the black man labours. He Rev Dr Uma Ukpai told me specifically that God is about to change the fortune of Anioma and I believe. All those who have mocked us shall come to us Nicodemusly to ask us the secret of our turn around blessings. We are working on so many things. We are synergizing too. So trust us when we say the challenges you see with Ogwashi today, soon you see them no more. Ogwashi is not only going to host Crusade, soon she will host international events like App development contest, Maths and Science Olympiad to mention a few. Sir, What Advice Do You Have For The People Of Ogwashi-Uku, Anioma and Deltans In General Concerning This Programme? A season of change has come and it will sweep across every area. KIDNAPPING, LIGHT BLACKOUT, KILLINGS, WITCHCRAFT, BAD LEADERSHIP WILL BE HISTORY. A season of supernatural manifestations, breaking of curses, unification and outreach.